Hannukah Chanukah Hanukkah is almost here. Some of you may remember that I have a box for each holiday. That way I can procrastinate like crazy, and pull out the box on the eve of the holiday and have everything I need. But the last two years kind of got away from me, such that some books and toys came out of the boxes and never went back in, and other things got mis-filed, and all in all I can’t rely on the boxes right now. Know what wasn’t in my chanukah box? We do own several chanukiyot (menorahs). I have no idea whether they’re mislaid in a different holiday box or whether they’re in one of the many boxes we’ve yet to unpack after the big move. Whichever it is, my chance of finding one of ours before the holiday starts on Sunday night is slim to none. So I did what I always do when I need something right away. I made it myself. Okay, the kids made some too. We spent ninety minutes in the Makery (it’s what we call our basement craft room: “Welcome to the Makery! Don’t just stand there… make something!) and ended up with more menorahs than our family can light at once. Ready to bake. The pieces on the right will be glued to a nice piece of wood. Crisis averted! Now, to buy some more candles so there’s no menorah left behind. Happy Chanukah! It seems like a total cop-out to have my first post back after a year of silence be a collection of random photos… so I’ve cobbled together an intro for you. Our home has been completely renovated, bottom to (new) top. In place of our old three-bedroom bungalow we now have a two-storey house with attic, with a bedroom for each child. Of course, I have to share my bedroom with Mr. December. I always have to share. It’d be annoying if he wasn’t my best friend. There are others. There’s the kitchen /dining room hutch; the in-wall cabinets in various stud cavities; Little things like lights that I upcycled or repainted; A powder room vanity that I hacked from three IKEA vanities; laundry room cabinets… and there’s still quite the list in my “to build” spreadsheet. So that’s what I did on my summer vacation… and all spring and winter before that. And it’s what I’ll be doing for the foreseeable future. And for the sake of both my readers, I’ll post about the renovation, with lots of pics. We’re living at my parents’ house this year, while our house undergoes extensive (and expensive – I always wonder how often those two get misheard as each other) renovations. Yes, after so much deliberation we’re finally gutting our little bungalow, adding a second storey and an attic, and completely rearranging the main floor and basement. It’s exciting and I want to tell you all about it, but not today. Anyhow, as I was saying, we’re living at my parents’ house this year. Normally we’d drive to school – at 8 km, the distance is too great to be able to bike there. 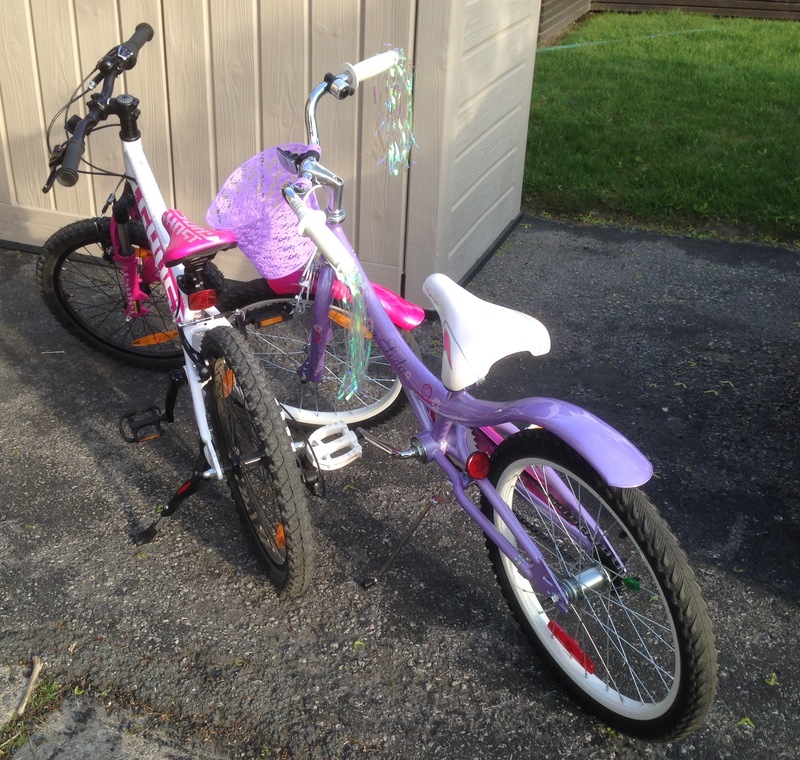 Living with my parents, though, puts us a mere 2 km from school – and so we bike as often as we can. If you’re one of my two loyal readers, you know how I feel about biking. Imagine how exciting it is that three of my children can finally ride their own bikes. I have to say, the bike commute is something I’m really going to miss when we move back to our own house. I actually don’t mind that the ride is sometimes more an exercise in frustration than just exercise. One of our parenting goals is to help our children develop some serious grit. As often as I can, I like to tell them, “It’s okay that it’s hard. You can do hard things!” I like to remind them, as they pedal right up the incline at the end of our street, that they used to have to get off their bikes and walk up that “hill.” I’m hoping that this contributes to a growth mindset, where the kids see that with repeated practice the morning ride becomes easier, and more good than bad. But every day, easy or hard, good or bad, we start the day with physical activity, fresh air, and a tour of the neighbourhood where we greet the same faces day after day. It’s awesome even when it’s not, if you know what I mean. And yes, those photos were actually taken en route to school. Aren’t we lucky to have such a picturesque route? I’m going to miss this – and I’m not romanticizing! 1985. I’m five years old, and my family keeps remarking that I have “no zitsfleisch” (literally, “sitting flesh”) – I simply can’t sit still. My teacher remarks to my mother that I’m paying attention… to everything except the lesson. My mother asks the teacher to ask me a few questions about the material. Turns out I’ve heard it all. Mum figures I was bored. 1990. I’m becoming more out-of-sync with my peers, socially speaking. I don’t have many friends. It often feels like the other kids are being rude or mean to me. At least I’m excelling academically. I’ve learned to sit still, but something is always moving – usually my toes, tapping out a pattern inside my shoes. 1997. I have friends now. I’m still a good student, except in math and chemistry. As equations get longer, I can’t seem to do them properly. I understand how it works, I understand what I need to do… but somehow I get derailed and end up with the wrong solution. The only time I can succeed at math is when my dad sits next to me and keeps me focusing on the next step. In the end, I drop math. I’m still tapping my toes. 2001. I’ve done a couple of really cool things in the last few years: I wrote and produced an album of original songs; I ran a half-triathlon (and came second in my age class). The album never got anywhere – I didn’t really bother promoting it at all. The triathlon was a one-off: fun to do once, but I felt no need to repeat it. I’m bursting with creative ideas and often can’t wait in meetings – by the time my turn to talk comes I’ll surely have forgotten what I was going to say because of the twenty new ideas that have flashed through my brain in the intervening minutes. My apartment is littered with half-drunk glasses of water and cups of tea – every time I put my drink down and do something else, I forget where I left it… so I go to get a new one… several times a day. 2005. Despite my amazing memory for names, numbers, and trivia, I tend to forget a lot of things. Leaving the house involves a few false starts: Oops, no keys. Oh, my sunglasses. Where is that cheque I had to mail? I’m great at organizing systems, but not so good at keeping them organized. I’ve learned enough about myself to know that I have lots of good ideas – it’s the follow-through that I’m terrible at. I joke that I’d rather build a new table than clean the one I have. 2015. I have four children and am now responsible for organizing 5 (sometimes six) lives and schedules. I miss a lot of things. Double-booking myself is a frequent occurrence and I usually just hope that someone else will cancel and it will magically work out (it often does.) I’m often late. I forget to do things that need to be done. I’m terrible at imposing (and maintaining) structure and routines for my kids. My husband is frustrated with my constant failure to remember and follow through. I’m frustrated with myself. What is wrong with me? While reading a book about how to help my child who has been diagnosed with ADHD, the penny drops. I speak to my psychiatrist who assesses me and says, “well, looks like you have ADHD.” What a relief – it’s not my fault. I can work with this. 2017. Things have improved tremendously. I’ve stopped berating myself for being inconsistent and careless. My husband understands now and helps me develop better systems so I can remember and get things done. I’m still terrible at implementing routines at home, but I don’t beat myself up over it anymore. My toes are still tapping and I still have abandoned water glasses everywhere. I still find it extremely difficult to maintain focus on things that are hard for me, and I still get distracted by minutiae – but now I can see it happening and get myself back on track much more quickly. I’m still bursting with ideas. Nothing has really changed. Everything has changed. I’ve heard it said that “labels are for clothing, not people”; but I disagree. Labels come with care instructions – and I definitely needed some of those. Night owl seeks 6 a.m.
Oh sure, I’ve aspired to be a morning person my whole life. The early morning is so peaceful and calm, not to mention the beautiful sunrises. But I’ve never managed to keep it up. A week here, a couple of days there, and the exhaustion would hit me hard enough that I gave it up. The only difference that I can see is my mindset. Waking up later is not an option anymore; the same way that 8:00 used to be my cutoff wake-up time because otherwise the kids would be late to school, 6:00 is now my cutoff wake-up time because otherwise I’m just not as nice a parent or as effective a person as I’d like to be. I never thought my penchant for reading fanfic on my phone would help me become a morning person, but here we are. I usually read for about 20 minutes before I even get out of bed. I find that the light from the screen wakes up my brain. A few articles or some chapters of a story, and I’m awake enough to get up without hurting myself. I get dressed right away. I arrange all my morning clothes – including socks and underwear – one one hanger that hangs on the door handle of my wardrobe. I can (and usually do) get dressed in the dark. It’s quick – no decisions, no searching for the perfect socks – and once I’m dressed I can’t get back into bed. When I leave the bedroom, I close all the doors to the bedroom hallway and then turn on every light in the kitchen, living room, and dining room. It helps me pretend that it’s not still nighttime. And then… then my time is my own for at least half an hour. I blog. I stretch. Sometimes I clear my desk and pay and file the bills. Some mornings I start a pot of oatmeal on the stove. I get important things out of the way before my day really begins. Is all this worth it? You could ask my kids, who’d probably tell you that now I wake them up with a song and a snuggle instead of by shouting, “Get UP! We have to GO!”; you could ask our violin teacher, who would tell you that the kids’ progress has accelerated since we started practicing daily before school (after school practice was a fight); Or you could ask me. I like myself better when I wake up early. By 9:00 a.m. I’ve already accomplished something beyond getting the kids to school. I’m so much more productive when nobody else is awake that my morning half-hour of work can easily cover an hour or more of daytime effort. And that’s a really good thing, because holy cow, am I exhausted. I’m going to need a nap. Are you an early riser? An aspiring one? An unapologetic night owl? Share your tips, if you’ve got any, in the comments below. If mine stop working I’m going to need more in my arsenal. I’d forgotten how insane the first two years of a new baby are. I mean, really insane. But the little one is almost two now, and suddenly I have time to do projects AND blog about them! Last year we started doing Suzuki violin with the three older kids. Then I got violin envy and bought myself a cheap violin so I could play along with them during practice. And then I started to miss my viola, so I reclaimed it from my brother (he borrowed it in high school) and traded it in for something smaller (I have no desire to repeat the tendinitis I had in high school). So now we have four violins and one viola, and that’s a lot of cases to keep out in the living room. Have you ever noticed that the stupidest things can keep you from doing a task? Like, the garbage can needs a new bag but you don’t really want to put one in, so you leave the cheese wrapper on the counter for the next person to deal with? Around here we call it “friction” – the annoying little things that are a deterrent to doing things right. Having a laundry hamper with a lid is friction. Having to stand on a step stool to reach the healthy food is friction. Having to open your instrument case, remove the instrument, attach the shoulder rest, and remove the bow – you’d better believe that’s friction. Can you spot the viola? It started life as a BONDE storage unit from IKEA. We’ve had it for 12 years and have used it to store wine glasses, serving platters, candlesticks, menorahs, and basically anything that wasn’t ugly enough to put behind closed doors. 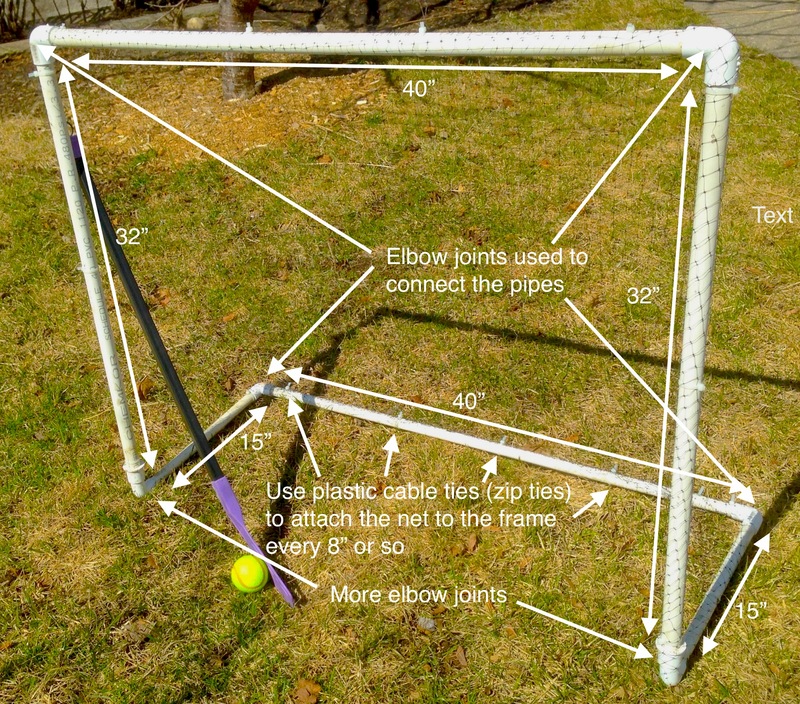 1×3 dimensional lumber, length determined by the side of your cabinet and the number of instruments being stored. several wire hangers – one hanger is good for two instruments. So here’s how I did it (in about 10 minutes.) First, I took a piece of 1×3 lumber and drilled holes into the side. You’ll have to measure your instruments for best results, but I found that a spacing of four inches between instruments works well for the children’s violins (1/16 to 1/4 size) and six inches are needed for a full size violin and 15″ viola. So measure those distances on each side of the board, and using a narrow drill bit, drill holes into the sides. The holes on both sides should line up with each other. Next grab some plastic-coated wire hangers (we get them from the dry cleaners), cut off the twisted and hooked part, and straighten out the rest with your pliers. Cut a length of 12″ for each instrument you’ll be hanging. Then shape the wire into a rectangle (about 3″ on bottom and 3 1/2″ on either side), with the cut ends forming the top of the rectangle. Partially fill the holes you drilled in the 1×3 with carpenter’s glue. Place the two cut ends of the wire rectangle into one pair of holes (one end on either side of the 1×3) and press them as far in as they will go. Hold them there for a moment so that they stay when you let go. Repeat for as many hangers are you need. Theoretically you should be able to stop here. But I’m paranoid about my instruments, and so I added a strip of 3/4″ moulding to each side of the board (I used both glue and nails) so that the wire cannot be pulled out of the board. I recommend doing that. Finally, you’ve got to attach the hanger to the inside top of the cabinet or shelf. I was able to take the shelf out and install the hanger while it was on the floor, but you might have to do this inside the cabinet. If you do, get someone to help you hold it up straight while you screw through the board and into the top of the cabinet. I used 4 screws and it’s quite solid. The bottom line here is that in one fell swoop I’ve reduced the number of excess wire hangers, used up some of my scrap wood, and made it extremely easy to just pull an instrument out and play it – even for a short minute or two. The kids practice more, I practice more, and the living room looks just a bit more sophisticated. Better living through chemistr- I mean, manual labour. See that? It’s my new antidepressant. Until a few weeks ago, I had never wielded an axe. But we had these two trees in our yard that had to come down, and given how much I love wood fires it seemed prudent to keep the wood. Unfortunately, the arborist wasn’t willing to go as far as splitting the logs for me. That’s how I wound up on Amazon, buying an axe. It arrived two days later. 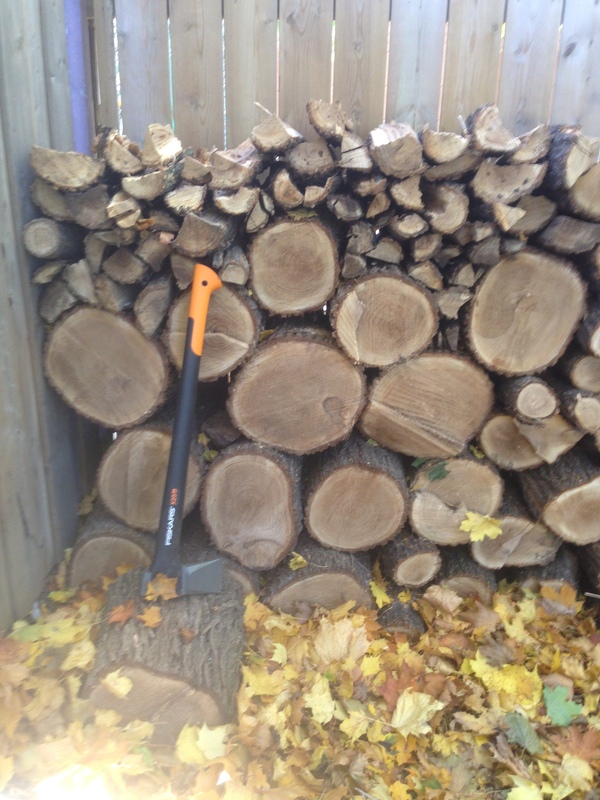 I had watched a youtube video and read a few articles about how to split wood, and so I ventured out into the backyard to get started on my woodpile. I set up a large stump as a chopping block, cleared the area around it of tripping hazards, and picked out a couple of good-looking logs to be my first victims. I’ll spare you the blow-by-blow (pun intended.) Instead I’ll just tell you that the entire time, I felt like some Hollywood princess on a reality show about trying to live like pioneers. The axe bounced. The wood toppled over. I chipped off tiny little pieces of kindling when I’d really been aiming for the centre of the log. After an hour I was sweating profusely and my arms were shaking. I had split a grand total of ten logs. It felt good. In psychology 100, we learned about “learned helplessness.” Scientists put puppies in a box with a little divider. Once the puppies were settled on one side of the box, they were given a mild electric shock. The puppies moved to the other side. At this point, the control group was left alone (only receiving shocks if they returned to the first side of the box) while the experimental group was given shocks no matter where they moved. It didn’t take long for the puppies in the experimental group to just lie down and give up. That’s learned helplessness: the feeling that whatever you do, nothing will ever change. And learned helplessness is a factor in clinical depression. So much of our work is cerebral, ephemeral, or both. It’s easy to feel like what we do doesn’t really make a difference. There’s so little concrete work in our modern urban lives. That’s why I’ll be heading out most mornings to swing an axe, chop some wood, and achieve a better life through manual labour. Instant gratification is nice. Working hard towards a goal feels good in its own way, but there’s something fun and exciting about being able to start and finish a project in the same hour. 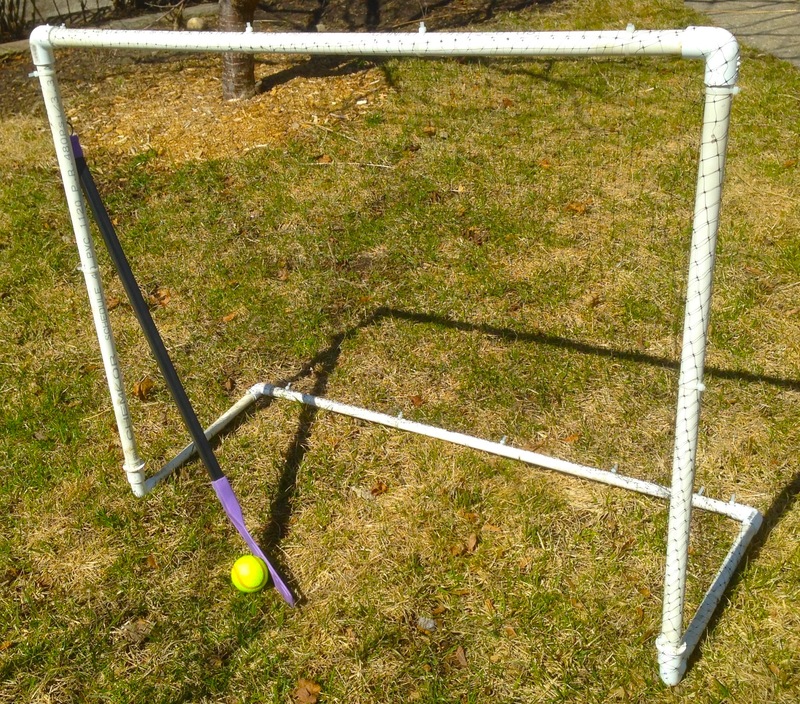 N has been really into street hockey lately, and R likes kicking a ball around, so I’m hoping this net will inspire some pickup games. Netting – I used plastic netting that is sold in the garden centre, but use whatever you like. You’ll need a piece that’s at least 48″ wide and 48″ long. Happy building! I’m going out to play. Those of you who are still with me (yes, all five of you) might remember my dilemma over moving up from a dumbphone and iPod to an iPhone. Well, I finally took the plunge, bought a used iPhone 5, and discovered that I had nothing to fear. Well, not much. I got a pretty small data plan which allows me to check maps and such when I’m out and about, but doesn’t do much else without WiFi. At $35 a month, it’s only $5 more expensive than my previous talk-only plan. So on that score, it’s all good. Now, as for my fear of using it all the time and not looking up from it: Since I’ve disabled most cellular data on my phone, there’s not much I can do with my phone when I’m out with the kids. I haven’t even installed Facebook, and I won’t. Frankly, the only time I pull out my phone when I’m out with the family is to check the time or use the camera. Ah, the camera. I used to be the kind of parent who rarely remembered to bring the camera, and thus missed out on some very sweet moments. Not anymore. My phone’s built-in camera is actually better than the digital camera I was using before, and I use it all the time. Score one for the iPhone. She also phones people for me, takes dictation, and tells me how long it will take me to get to my next destination. And she remembers everything I say. I think I’m in love. Long story short: I love my iPhone. It makes my life so much simpler, less frustrating, better documented, and just better all around. If you’re fearing the smartphone like I was, take heart: it’s just an external brain. You get to decide how to use it – and how not to.